11/28/2012 Bill Roberts | Entertainer Jamie Foxx recently in public declared President Barack Obama to be our “Lord and savior.” An artist has now taken the bold declaration a step further as an obvious attack on Christianity. Michael D’Antuono’s painting, “The Truth,” originally scheduled to be shown in New York’s City’s Union Square in 2009 but whose display was cancelled due to public outcry from Christian groups, is finally seeing the light of day at the Bunker Hill Community College Art Gallery in Boston. 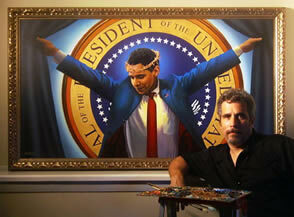 The painting, depicting Obama posed as Jesus Christ on a cross including a crown of thorns on his head with his outstretched arms pulling back curtains to unveil the presidential seal, is part of an exhibit called “Artists on the Stump, The Road to the White House 2012. The exhibit will be held at Bunker Hill through Dec. 15. D’Antuono told Fox News his patience has paid off and that the display is vindication for him. “I always regretted cancelling my exhibit in New York because I feel my First Amendment rights should override someone’s hurt feelings,” he said. “We should celebrate the fact that we live in a country where we are given the freedom to express ourselves. “The crucifixion of the president was meant metaphorically,” he said. “My intent was not to compare him to Jesus.